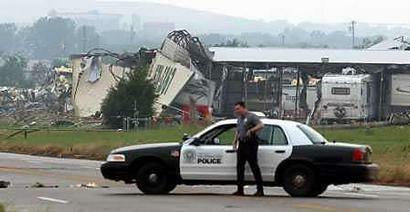 Police arrive too late to arrest a passing tornado in an industrial area of south Oklahoma City damaged by a tornado that skipped through central Oklahoma. 225 tornadoes have been sighted in the United States in the first seven days of May, yet none have been arrested so far. ?They move so quickly and appear out of nowhere, so they are very difficult to apprehend,? stated Oklahoma City Police Chief Randy Wicklund.